The distance difference between clubs is created equally by the increments in club length and loft angle. The calculations here are based on 1/2″ club length difference = 5 yards distance difference and every 4° loft angle difference = 5 yards distance difference. If 4° loft does not divide out in even increments, simply interpolate the distance. In the example below: 19° difference between the 5 iron and PW = 19° ÷ 4 = 4 with 3 degrees left over. So, 4 x 5 yards = 20 yards. The 3 degrees loft left over = 4 yards, so 20 yards + 4 yards = 24 yards. Do not get too serious about this interpolation thing, a close guess is usually ok. This calculation method is, however, quite accurate and is the best way to fit clubs regarding distance differences in your iron set. You will usually find that 5 yards works for most golfers; however, for many better players and also stronger players, you will find 6 yards works better. Most golfers get 10 yards overall difference between clubs, but others get 12 yards overall difference between clubs.I have worked with a few touring pros who get 14 yards overall between irons with their normal swing (this means you would need to use 7 yards for each 1/2″ difference in club length and 7 yards for each 4° difference in loft angle. The incremental distances hit with hybrids and fairway metals will vary the most due to the many different specifications used by each manufacturer. This is why we need to list and evaluate all of our yardages, especially with hybrids and fairway metals when deciding to replace a club in our set with another. Look over the example closely. It should help you in being able to calculate your own yardage to determine if you have the best set make-up or to fill-in any yardage gaps that hurt your game. 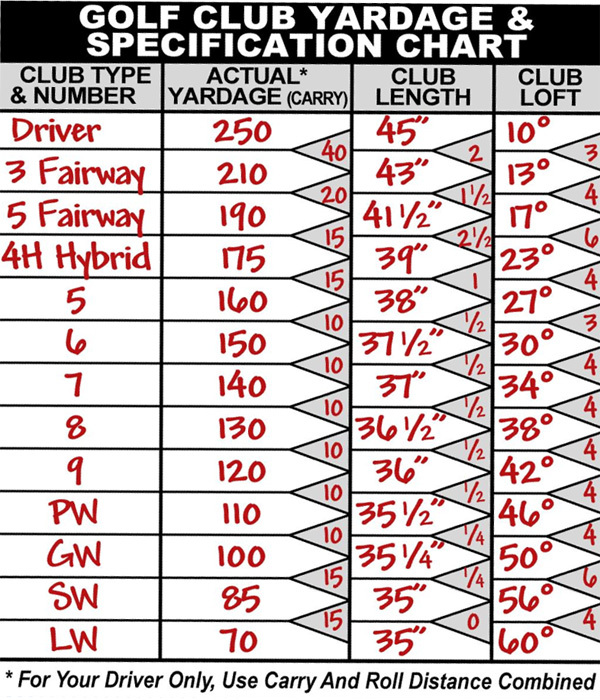 Fill-in your current set using the yardage specification chart to the right and try to evaluate it. This can be quite interesting and may tell you that you need to add in a hybrid or a new or different fairway metal. Remember, you are doing this for two possible reasons: First, you may want to even out your incremental hitting distances. Second, you may want to substitute a club that is easier for you to hit.